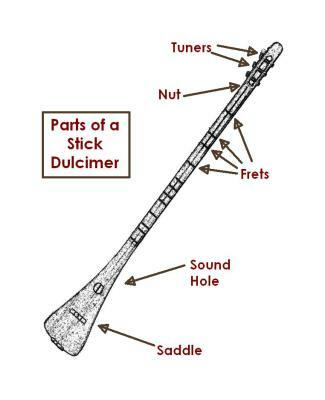 By numbering frets we can specify a tune without having to read music. "0" means to strum with no frets pressed. 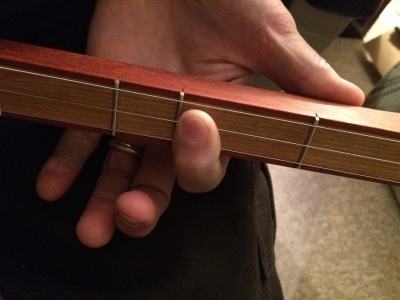 "2" means press behind the second fret from the nut. Strum all three strings once for each number. Strumming in this order gives the beginning of a do-re-mi scale. 0 2 4 4 4 It sounds something like this. These notes begin a traditional song. Mi-chael, row the boat a-shore. Al-le-lu-jah! Mi-chael, row the boat a-shore. Al-le-lu-u-jah! the melody string and the middle string. then play the chorus on all three strings. O I come from Alabama with my banjo on my knee. I'm goin' to Loui-si-a-na my Susanna for to see. O Susanna! O don't you cry for me. For I come from Alabama with my banjo on my knee.